Recoil…action and reaction…is really no more than acceleration brought about by a force applied. The force generated by burning powder and expanding gases create pressure and directional movement of the gases. A force vector. These forces provide acceleration of both bullet and breechblock…which is essentially what the slide is. Force is applied in equal measure on both. Actual recoil in the Newtonian sense is only in play while the force is present. Once the force is removed…either by stopping the gas expansion or the the bullet exiting. Actual recoil is over so quickly that by the time our brains can process the fact that something has happened…it’s over…and what we perceive as recoil is actually momentum. Recoil behaves differently in an autopistol than in a fixed breech arm, like a revolver or a bolt-action rifle. In the latter, recoil is immediately transferred to our hand or shoulder through the frame or receiver. 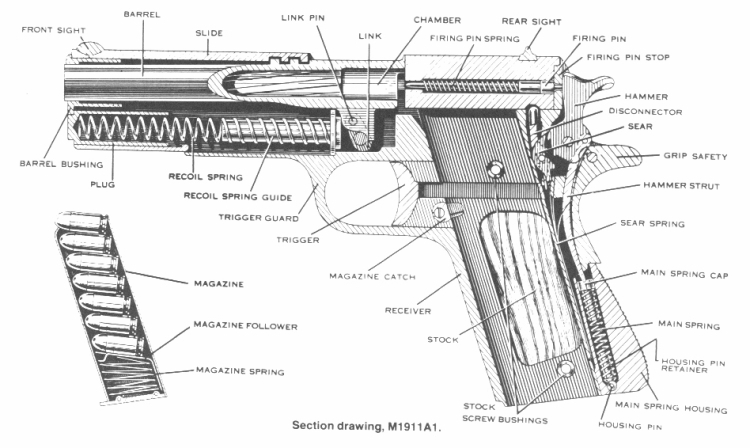 With the autopistol, the recoiling part…the slide…is only connected to the frame through springs. In truth, the “gun” is the slide and barrel assembly. The frame is essentially no more than a gun mount…and the “gun” moves on rails. Hypothetically, you could build a pistol with 30-foot frame rails, and mount the slide on the end with no spring connection…fire the gun…and feel nothing in the way of recoil unless the slide reached the impact abutment. What we perceive as recoil is mostly muzzle flip, and that happens when the slide impacts the frame. By the time the slide hits the frame, the bullet is about 20 yards downrange. The recoil system is a separate closed system. When the slide starts to accelerate rearward, the spring becomes a force vector, and sets in motion an action/reaction event that is separate from the ballistic event occurring in the “gun” assembly. As the slide compresses the spring, the spring pushes forward on the slide…and backward on the frame. The stiffer the spring, the harder it pushes on the frame. While the stiffer spring does buffer the impact slightly, the sharper transference provided by the spring more than makes up for it. This can be easily demonstrated by firing a 5-inch gun first with a 14-pound spring, and then with a 20-pound spring. Simply put, the stiffer the spring, the more “solid” the connection between gun and mount. We simply don’t need to overspring the gun, regardless of the hype. If the gun is properly set up, it will run just fine with a 12-pound spring. But waitadamnminnit, Toon. Why do short variants have stronger springs? Isn’t that done to reduce the greater impact by the lighter, faster slides? Nope. Assuming equal spring rates, the less massive Commander slide doesn’t hit the frame any harder than the 5-inch slide does. It’s moving faster..but it’s moving under the same momentum as the more massive 5-inch slide. If a stronger spring is used….it doesn’t hit as hard. Since the GM and Commander frames are essentially the same, aside from shorter rails and dust covers…and relocated impact abutments…the frame suffers no more than that of the Government Model class even with identical spring rates. Simple physics. Bullet and slide momentums are theoretically the same. I say “Theoretically” because precisely equal momentums only occur in the absence of outside force, or in the presence of equal outside force. Because no normal gun can operate with equal outside force…the momentums can’t be exactly equal…but they’re so close that they can be assumed equal for the purposes of this discussion. The less massive Commander slide is moving faster with a given cartridge…but because momentum is a function of Mass X Velocity…the momentum at the time of impact is therefore identical. Commander felt recoil is sharper than the 5-inch gun because a higher spring rate is typically used. Use the same spring rate, and the felt recoil will be virtually indistinguishable. Then why the heavier springs in Commanders? Again…The answer lies in understanding that the autopistol’s function is all about self-loading and returning to battery. It’s not so much about firing the shot as it is about the pistol readying itself for the next shot. In order to do that successfully, the slide must feed and chamber the next round. Because that function is identical between the two pistols, the force required to overcome the resistance is the same…therefore the momentum in the slide must be up to the task. Because the slide’s mass is lower, it must be driven faster to generate the needed momentum to drive it to battery. The other problem with the Commander is that the slide travel is shorter than the 5-inch gun’s, and the runup…the distance between the rearward limit and the magazine…is also shorter, giving the slide less time and distance to gain speed and momentum, so the spring has to accelerate the slide at a higher rate in order to compensate for both its mass and its shortened runup. Which bring us to that plastic gadget…the ubiquitous shock buffer. That silly little thing is the “Pet Rock” of the 1911 industry. Another example of Snake Oil Marketing. It would be hard to estimate how much money has changed hands since the shock buffer burst upon the scene some 30 years ago. Pure genius. I wish I’d thought of it. What many fail to consider is that the shock buff negates the rebound effect…the bounce…of the slide impacting the frame, which gives the slide a boost and makes the spring’s job a little easier and less critical in providing enough acceleration to return the slide to battery. There’s just no such thing as a free lunch. The main problem with the 1911 today is that so many people have been trying for so many years to prove that they know more than Browning and his engineering Dream Team…that they really believe they have. Over a hundred years ago, a man who is arguably the premier firearms design genius of the last two centuries and a team of very smart guys burned a lot of midnight oil in determining the proper spring rates for that pistol. They really did know what they were doing. Are you sure about this??? I was always under the impression they took that 1" of slide off the front end? I do know on a Combat Commander I had a long time ago the slide would work on a GM frame but, the dust cover was shorter? As a Navy Gunnersmate we spent several days in the classroom learning the pros and cons of free recoil and how it is controlled/turned into useful energy from .22 pistols to 16" guns.